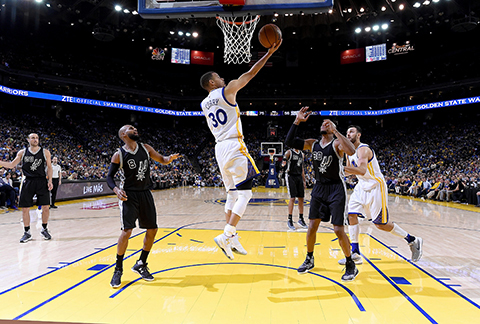 OAKLAND: Stephen Curry scored 27 points and the Golden State Warriors became the second team to win 70 games in a season by beating the San Antonio Spurs 112-101 on Thursday night, wrapping up home-court advantage throughout the playoffs. The Warriors (70-9) bounced back from their second loss in three home games two nights earlier against Minnesota and joined the 1995-96 Chicago Bulls as the only teams to win 70 games. Golden State can break Chicago’s single-season record of 72 wins by sweeping the final three games, including a rematch in San Antonio tomorrow. Harrison Barnes scored 21 points and Draymond Green added 18 to help the Warriors avoid losing back-to-back games for the first time this season. Golden State has outscored the opposition by 14.6 points per game following its nine losses. Kawhi Leonard scored 23 points for the Spurs, who will enter the playoffs next weekend as the second seed in the West. Dwyane Wade scored 21 points, Joe Johnson added 17 and Miami shook off a slow first half to beat Chicago, clamping down in the final minutes for its ninth win in the last 10 home games. Goran Dragic and Hassan Whiteside each had 16 points and 12 rebounds for Miami, which has 14 consecutive games of scoring 100 or more at home – the second-longest such streak in franchise history. Luol Deng scored 13, Josh Richardson had 11 and Amare Stoudemire added 10 for the Heat (46-32), who remained fifth in the Eastern Conference. Jimmy Butler scored 25 points for the Bulls (39-40), who now need a series of miracles to get into the postseason. Pau Gasol finished with 21 points and 12 rebounds, and Derrick Rose scored 17 for Chicago. Jeff Teague scored 23 points, Kyle Korver added 14 and Atlanta held off Toronto. It was one of the season’s best performances for the Hawks, who remained in third place in the Eastern Conference by beating the East’s No. 2 seed. With Paul Millsap scoring 13 points and Al Horford, Tim Hardaway Jr. and Mike Scott each adding 11, Atlanta used a balanced attack to knock off Toronto for the first time in four tries this season. The Hawks have won 16 of 21 and are a half-game ahead of Boston for the third spot in the East. Toronto dropped 31/2 games behind first-place Cleveland. Kyle Lowry and DeMar DeRozan each finished with 16 points and Jonas Valanciunas had 13 for the Raptors. Toronto has dropped two of three. Mirza Teletovic scored 26 points off the bench, P.J. Tucker added 24 and Phoenix dealt another blow to Houston’s dwindling playoff chances. It’s the second straight loss for the Rockets, who entered the day in ninth place in the Western Conference after a loss at Dallas on Wednesday. The game was back and forth through the first few minutes of the fourth quarter before the Suns took over. They scored 10 straight points, with eight coming on free throws, to take a 117-110 lead with 1:03 left and send fans streaming for the exits. Tyson Chandler added 21 points for the Suns, who snapped a NBA-high, seven-game skid. James Harden led Houston with 30 points.